The Mighty, Mighty Half Truth was first put on display at Art-O-Matic in 2008 and has since been featured as an annual one-night pop up at small venues in and around Mt. Pleasant, a neighborhood in Washington, DC. For the first time, it is going “live” and can be seen outside of the once a year show. The concept features a portrait, a “Half Truth” and a “Whole Truth.“ The half truth is a statement that is printed onto the portrait and is technically true but is intentionally intended to deceive the viewer. The whole truth is in a packet and because of the volume of the stories takes time to find. During those moments, the viewer naturally starts to construct their own story about the individual based off the Half Truth and the portrait. The viewers stereotypes and personal history (both potentially positive and negative) can run wild. Then the viewer learns the truth. The project is intended to allow people to share a story about themselves that is important to them, makes them unique, has shaped them or one they simply want to tell. There are parameters, but they are general and malleable. If you are interested in joining the project, please contact me at kw@kwhipple.com for more information. The idea of this project goes back to visits with my maternal grandmother who had severe Alzheimer's at the end of her life. I learned that it was futile to share who I was and what I was doing, because she would not remember and caused confusion. Instead, I asked her about her life and what it was like growing up in northern New Hampshire on the front third of the 20th Century. Those stories were fascinating and brought us both joy. My grandma told me that when she got into trouble in elementary school during the winter months, and had to stay late, her own mother was extremely cross because it meant taking the horse and buggy out after dark. She also told me about moonshine. Specifically, she told me that my grandfather ran moonshine. The grandpa that I knew, who passed when I was 14, did not drink or smoke or cuss and was a hardworking, well respected man who appeared to have found no need to cross the law. I learned that my family didn’t run booze to get rich but to get by. They were farmers and the depression was difficult and the booze helped keep them on their land. One of the kinfolk was a local police officer and would tip my grandfather off as to when the Federals would come through, hoping to find an illegal liquor operation. And, fortunately for my family, they never did. I ate up these stories and when I would see my mom she would want to know what I had learned. I have found it true that parents often share less with their own children about certain aspects of their life and as such, my mother was hearing these stories for the first time. Meanwhile I was still putting the pieces together around the other life that my grandfather lived on the other side of the law all those years ago. I imagine it was justified in my grandfather’s mind, I think most people now wouldn’t be critical of some poor farmer trying to tie ends together by making some moonshine. But the real kicker? It wasn’t true. Or more accurately, it was half true. My mother accepted all the other stories I shared but she said the moonshine story simply wasn’t true. As I got ready to protest, she explained that my great-grandfather, who passed long before I was born, was the man behind the moonshine. My grandma saw me in the wrong generation. My grandfather was just a guy who wanted to marry a girl, so he well may have hid a still, and definitely kept his head down and his mouth shut when the Law came around but he wasn’t a moonshiner. It still made for a good story. 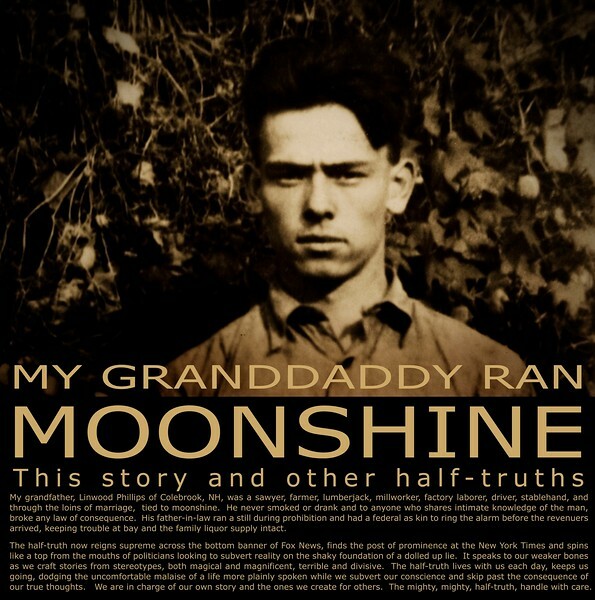 And this stuck with me, “My Grandaddy Ran Moonshine, This and other Half-Truths”. That rolled around in my head for a year or two until I decided to make a show of it. I am a natural introvert but curious about people and lacked a way to start a conversation. I struggled with portraiture and knew I needed to get better. This project has given me a platform for friends, acquaintances and some strangers to share their own story with me. I have been thanked for helping a story to be told and mostly I have been blessed to hear so many amazing people tell me something about themselves, to share their joy and their sorrow. I am thankful to you all.